OTTAWA, CANADA - Eurocom Corporation has launched an upgraded version of the super fast and super powerful notebook, the EUROCOM 888E Dream Machine, with 16.1" UXGA display, 128 MB DDR video ATI Radeon Mobility 9000 and Intel® Pentium® 4 processor supporting Intel Hyper-Treading Technology. A perfect solution for professional users, the new 888ES model supports Intel® Pentium® 4 processor up to 3.06 GHz with Hyper-Threading Technology. This groundbreaking technology from Intel enables the processor to execute two threads (a part of a program) in parallel. So software can run more efficiently and multitasking becomes more effective. Hyper-Threading Technology also improves processor performance and responsiveness, giving users the power to do more tasks on their notebook at once such as playing a game while encoding digital music or editing digital video while encoding digital music. 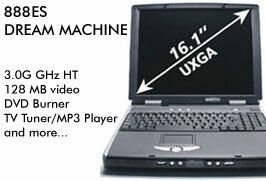 The superb 16.1-inch UXGA Active Matrix display with a 1600 by 1200 resolution and the ATI Radeon Mobility 9000 graphics engine with 128 MB DDR video memory give the new model the most advanced and visually stunning 3D performance for notebooks in the industry while the Hyper-Threading Technology feature adds powerful new graphics capabilities to handle today's most demanding programs and emerging software applications. When editing digital pictures or home movies, it can manage more filters, transitions, special effects, and media types at once, making the experience easier and more enjoyable. Mobility Radeon 9000 delivers the fastest-performing 3D graphics supporting the latest games, cinematic-quality video, and features that dramatically enhance all aspects of the visual experience in every application. The latest 3D games are played faster and with effects never before seen on a notebook. The ATI Mobility Radeon 9000 allows users to watch DVD movies at the highest quality, while the optional DVD-R/RW drive (DVD Burner) lets tham take advantage of increased entertainment and productivity capabilities including home movie editing and the ability to store large amounts of data such as multimedia presentations, digital images and audio files in DVD format. Users can also play DVD movies and CDs and save them in CD, DVD or MP3 audio formats faster than ever before. The EUROCOM 888ES Dream Machine comes with all other features supported by its predecessor, the 888E model, such as DDR266 SDRAM up to 1 GB, up to 240 GB of hard drive space with four physical hard drives, two optical drive bays for FDD, CD-ROM, DVD-ROM, CD-RW, DVD/CD-RW Combo or DVD-RW drives, a DJ CD Player function, a detachable SD Memory Portable Storage unit with a MP3 Player, 102-key real desktop like keyboard with a separate numeric keypad, built-in Wi-Fi standard antenna for 802.11b wireless LAN, optional internal IP Sharing Module for ADSL, optional TV Tuner with the S-Video In port, four USB 2.0 ports, IEEE 1394 FireWire, 10/100 Fast Ethernet, 56K V90/V92 Modem on-board and 10/100 LAN.